Please join us for the second annual UP, UP & AWAY 5K, on Saturday, July 28 at 8:00 AM. Serious and recreational runners and walkers are welcome! Start your morning at the beautiful Kent State University at Stark campus for a 5K looping course surrounded by the excitement of the potential for hot air balloons to both launch and fly over the campus. Two Spirit Airlines travel vouchers will be awarded to the top three overall male and female runners. Random race numbers will be drawn for door prizes. Each participant will receive a finisher medal, and a Sports-Tek t-shirt, with the option of short or long sleeves; must register by July 1 to be guaranteed your medal and preferred shirt size and style. So, we encourage you to register early to guarantee your finisher medal and desired T-shirt size. 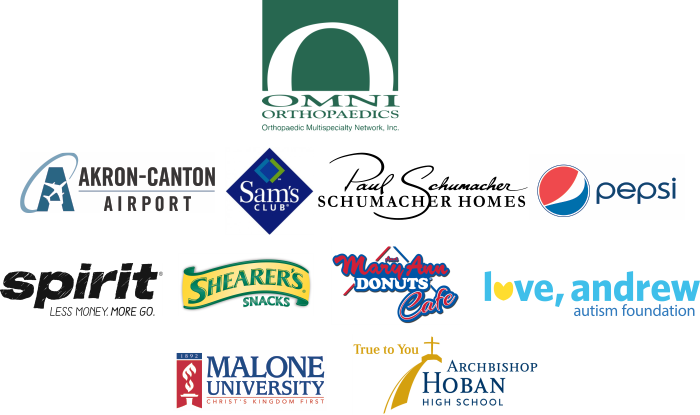 PACKET PICK-UP: Race packets can be picked up at OMNI Orthopaedics, 4760 Belpar St. NW, Canton, OH 44718, 3:30 pm - 7:30 pm on Friday, July 27, or race morning at Kent State University at Stark beginning 6:50 am. NEW to this year’s race event will be a FREE KIDS FUN RUN, sponsored by Schumacher Homes, along with “Spirit Bells” sponsored by Love, Andrew Autism Foundation. Kids ages 8 and under, will enjoy a course specified for them, amid the post-race activities. T-shirts and medals will be given to participants, but to be guaranteed specific shirt size and medal, you must register by July 1, 2018. Waiver must be completed by parent/guardian. The morning will conclude with refreshments and a MARY ANN DONUT EATING CONTEST. Donut lovers can register at all MARY ANN DONUT locations. For more information go to maryanndonuts on facebook. Age groups are as follow: 1-12, 13-15, 16-19, 20-24, 25-29, 30-34, 35-39, 40-44, 45-49, 50-54, 55-59, 60-64, 65-69, 70-74, 75-79, 80 & over for both Female/Male.